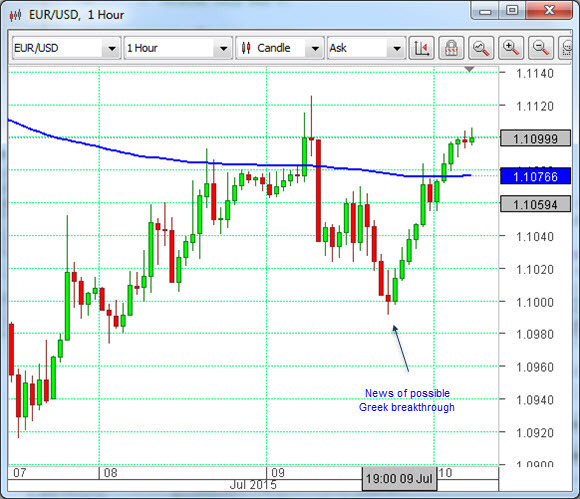 The EURUSD pair got a nice pop at the tail end of the US and during the Asian session last night on the news that came through about Greece. The government there has made its proposals to Europe, and on this occasion has actually delivered them earlier than the deadline that had been set. Not only that, they contain radical proposals, in terms of what has been looked for by Greece up to now. The Greek government seems to be using the ‘double mandate’ of a big win in the general election and the result it wanted in last week’s referendum to enable it to propose a package of fiscal reforms that go extremely close to those required all along by the EU and the IMF, in return for a third bailout program involving a three-year loan arrangement worth €53.5 billion. The fact that far-left members of the Syriza party do not like this proposal, and are calling a protest rally for later today, is probably a good sign. According to the Guardian newspaper, which has been consistently to the fore in reporting on the Greek crisis, this package includes major changes to VAT, to raise revenues worth a full 1% of GDP, and the removal of lower vat rates on the islands. Tsipras’s team has made concessions to the creditors on pensions, which was a so-called line in the sand for them before, and has agreed to put up the retirement age. The Greek government will raise corporation tax, but not by as much as previously proposed, and it will cut military spending. It will privatise state assets and last, but by no means least, it will put changes in place that will improve tax collection and deal with tax evasion. These measures are such that there is also provision made for humanitarian relief for the Greek people. The package still has to be passed by the Greek parliament. There is also the little matter of getting the agreement of the other Eurozone states, including Germany and Finland, that it actually goes far enough and that there is confidence that it can and will be implemented. We are going on vacation next week, so the commentary will be relying on archived material until our return, which will be on July 23rd.